General Headquarters American Expeditionary Forces. To the Secretary of War. SEPTEMBER 1, 1919. Sir: I have the honor to submit herewith my final report as Commander-in-Chief of the American Expeditionary Forces in Europe. 1. I assumed the duties of this office on May 26, 1917, and accompanied by a small staff, departed for Europe on board the S. S. Baltic May 28. We arrrived at London on June 9 and, after spending some days in consultation with the British authorities, reached Paris on June 13. 2. Following the rather earnest appeals of the Allies for American troops, it was decided to send to France, at once, 1 complete division and 9 newly organized regiments of engineers. The division was formed of regular regiments, necessary transfers of officers and men were made, and recruits were assigned to increase these units to the required strength. The offer by the Navy Department of one regiment of marines to be reorganized as infantry was accepted by the Secretary of War, and it became temporarily a part of the First Division. Prior to our entrance into the war, the regients of our small army were very much scattered, and we had no organized units, even approximating a division, that could be sent overseas prepared to take the field. To meet the new conditions of wafare an entirely new organization was adopted in which our infantry divisions were to consist of 4 regiments of infantry of about treble their original size, 3 regiments of artillery, 14 machine-gun companies, 1 Engineer regiment, 1 Signal battalion, 1 troop of cavalry, and other auxiliary units, making a total strength of about 28,000 men. 3. In order that the reason for many important decisions reached in the early history of the American Expeditionary Forces may be more clearly understood, and the true value of the American effort more fully appreciated, it is desirable to have in mind the main events leading up to the time of our entry into the war. 4. Although the German drive of 1914 had failed in its immediate purpose, yet her armies had made very important gains. German forces were in complete possession of Belgium and occupied rich industrial regions of northern France, embracing one-fourteenth of her population and about three-fourths of her coal and iron. The German armies held a strongly fortified line 468 miles in length, stretching from the Swiss border to Nieuport on the English Channel; her troops were within 48 miles of Paris and the initiative remained in German hands. 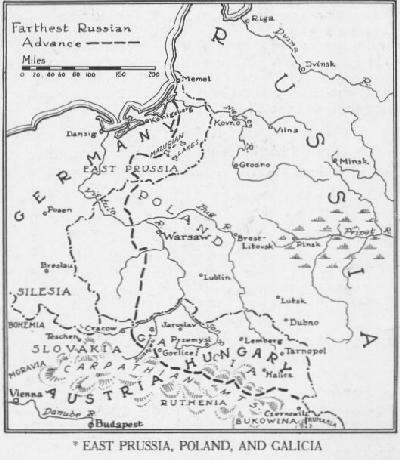 In the east the rapidity of the Russian mobilization forced Germany, even before the Battle of the Marne, to send troops to that frontier, but the close of 1914 found the Russian armies ejected from East Prussia and driven back on Warsaw. The entry of Turkey into the war, because of the moral effect upon the Moslem world and the immediate constant threat created against Allied communications with the Far East, led to an effort by the Allies in the direction of the Dardanelles. *NOTE.--Maps used are not a part of this report. All are from Progress of Nations (10 Vol. history of the world). Halftones used are not a part of the original report.